I'm considering a master bath update. I've started pulling all my thoughts together after combing Pinterest and browsing all of the various home improvement stores. I'm calling it Black & White Luxury. My current master bath vanity. The great thing is - I already have beautiful cabinets and hardware. The cabinet is painted an off-white color that will be easy to repaint. The countertop on the other hand is brown granite with specks of cream and black. My vision is to repaint the cabinet black with a white marble countertop (see top left corner of mood board below). I'm torn on the floor. I'd love to do a small white hex tile but worry that it may be too busy but love the classic and timeless look that it adds. The other option is a large grey tile with a finish that almost resembles linen (see bottom left corner of mood board). The walls would be painted grey (Sherwin-Williams 6255 Morning Fog), with a white Herringbone subway tile pattern above the vanity, covering the entire wall. 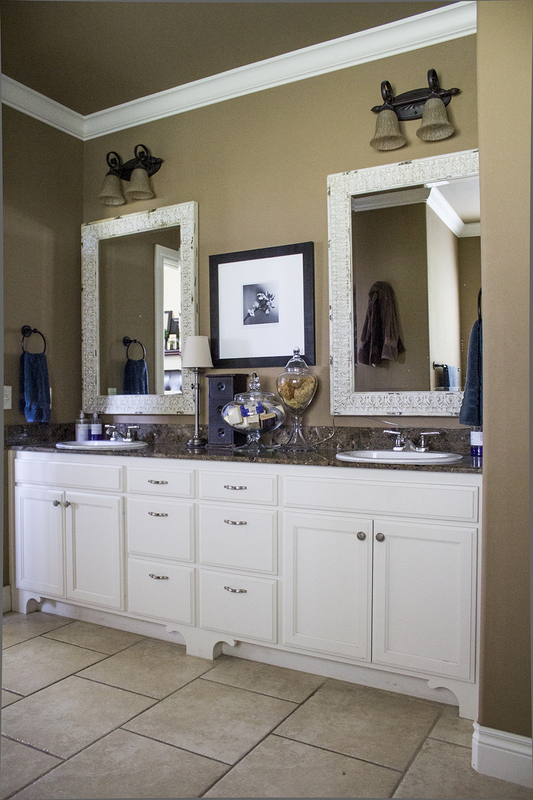 The two traditional oval sinks would be replaced by square sinks by Kohler with traditional hardware that tied it back to the light fixtures. Pottery Barn's beautiful Grosgrain Ribbon Roman Shade will be perfect for the one large window above the bathtub. And speaking of the bathtub; this is where it's going to be "fun." Like most new homes and homes built over the past 5 years, I have a built-in jacuzzi tub. It's big and great for baths but with the standard 4 cabinet doors that cover the front (allowing access to the plumbing), it just doesn't look all that elegant. I would love a free-standing tub like a claw-foot or pedestal. My current built-in jacuzzi tub. I've spoken to a plumber who feels confident we can rip out the existing tub. However, the plumbing to the jacuzzi tub is right up in front, hence the cabinet doors that hide it. We will have to drill in to the slab, moving the plumbing so that the pipes can be connected in the BACK of the pedestal tub. Hash Tag: Pain. My current shower has the standard travertine tile that I want to replace with a white subway tile, tying it back to the Herringbone tile wall. That's the plan as of today...More to come! Dec 24 I'm dreaming of a white kitchen...no more!